Syrus Dixon, 15, gets arraigned on a murder charge for the shooting death of Antonio Robinson inside the Stamford Superior Court House in Stamford, Conn. on Wednesday, Sept. 12, 2018. STAMFORD — A 15-year-old city boy charged with murder will be tried as an adult in the shooting death of a former high school football captain last May. Sirus Dixon did not make a plea to the charge while flanked by his lawyer and mother before Judge Gary White in a ground-floor courtroom at the Stamford courthouse on Wednesday. Two other Stamford teens, Karl Davis, 17, and Jimmy Jean-Baptiste, 18, were also arraigned Wednesday on accessory-to-murder charges in the case. 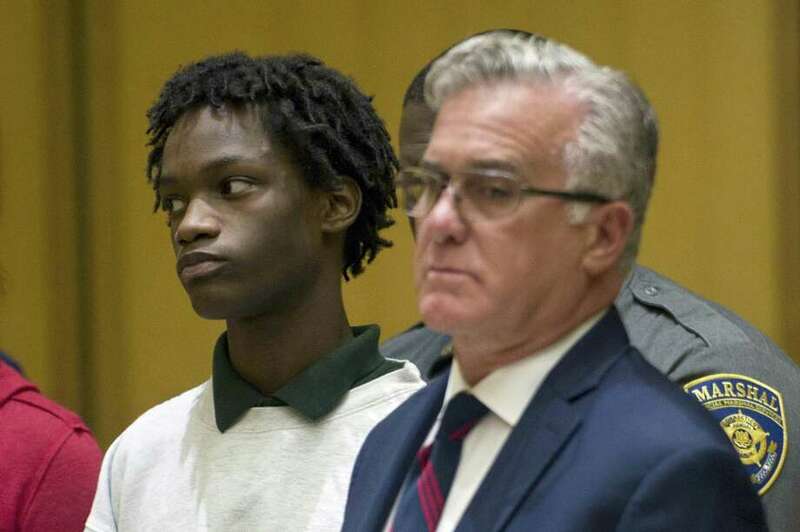 Supervisory Assistant State’s Attorney Paul Ferencek said Dixon is accused of shooting 18-year-old Antonio Robinson at point-blank range under the Interstate-95 overpass on West Avenue on May 31. Ferencek said Dixon was on parole when the shooting occurred. “This is a very serious case,” Ferencek said while requesting Dixon be held in lieu of a $750,000 court appearance bond. White, however, decided to go along with the bail commissioner’s recommendation and held Dixon’s bond at $500,000. Dixon is the youngest city teen to be arraigned for murder since Marquest Hall faced the charge at the same age for the stabbing death of Antonio Muralles, 52, outside the Bedford Street McDonald’s in 2015. Davis and Jean-Baptiste were also ordered held on $500,000 bonds. Robinson’s mother Ulondra Warran said she was relieved charges have been filed in the case. Devin Janosov, attorney for Jean-Baptiste, was also unsuccessful in his request to have his client’s bond reduced. Janosov said Jean-Baptiste, who came to Connecticut from Canada 14 years ago, was not a flight risk because all of his family now lives in Stamford. Janosov said Jean-Baptiste has been employed delivering pizza in Greenwich and was enrolled at Stamford High School. Stamford police Lt. Tom Barcello said Robinson and another friend were walking south on West Avenue on their way to play basketball at the Chester Addison Community Center on Selleck Street. Robinson and his friend encountered the three defendants under the Interstate-95 overpass, Barcello said. Barcello said the 15-year-old pulled a gun and shot Robinson as he was running away. The bullet went through Robinson’s back or shoulder and came out through his face, Barcello said. Robinson ran through the tunnel and turned on Baxter Avenue before collapsing next to a parked car, Barcello said. Barcello said veteran police officer Vito Sileo was working a side job a few blocks away and heard the gunshot. Sileo noticed three youths running from where he heard the shot, Barcello said. Capt. Richard Conklin said K-9 Loki and his handler Logan Pavia led police to the three suspects who were found about an hour later hiding in a nearby yard. The teens were charged that night with criminal trespass until the latest charges were filed on Monday.